RNA-Protein (RNP) complex plays a central role in gene expression by controlling translation, transcription, RNA processing, and so on. Then, we came up with the idea that understanding of the necessary factors to form the RNP such as RNA sequences and structures would enable us to artificially create RNP complexes to control molecular mechanisms and cell-fates. 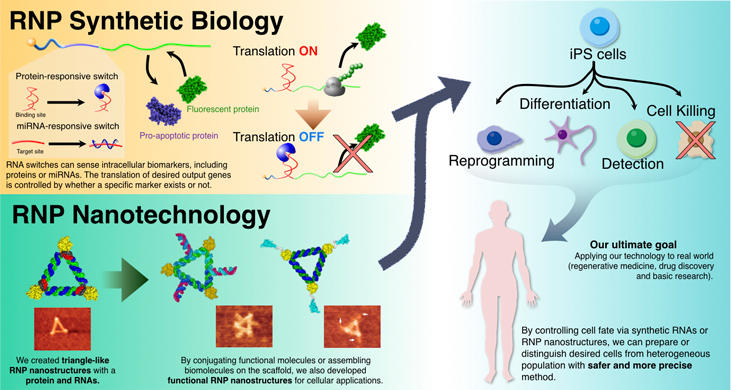 With this idea of synthetic biology, we are working on elucidating the programming mechanism of cells and controlling cell-fate precisely through the development of new technologies to understand, control and create RNP-based life systems. By utilizing cell type-specific RNA and protein markers, we are working on the following themes in order to develop technologies that control molecular mechanisms specific to target cells and apply them to medical research. (1-A) Construction of artificial RNA systems which detect intracellular information and regulate cell-fate. (1-B) Development of RNA switch technologies that safely and precisely identify and recognize the target cells. (1-C) Construction of RNP nanostructures functioning in cells and realizing RNP spatiotemporal control. In addition, we are engaging in the following themes in order to elucidate and control the molecular systems in the cell controlled by RNA and RNP. (2-A) Understanding of the molecular mechanism of post-transcriptional regulation in cell programming. 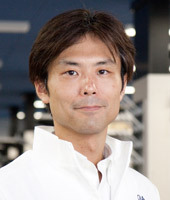 (2-B) Development of new technologies for comprehensive analysis of RNA-protein interaction. In our group, each graduate student will work on original research theme and acquire the skills and knowledge of synthetic biology, molecular biology, cell engineering.